We’d love your help. Let us know what’s wrong with this preview of Mouse Guard by David Petersen. The forest is a dangerous place for any animal, especially one as small as a mouse. In the past, the mouse world endured a tyrannical Weasel Warlord until a noble band of mouse soldiers fought back. Ever since, the Mouse Guard has defended the paces and prosperity of its kingdom. For generations, this league of scouts, weather-watchers, trailblazers, and protectors has pas The forest is a dangerous place for any animal, especially one as small as a mouse. In the past, the mouse world endured a tyrannical Weasel Warlord until a noble band of mouse soldiers fought back. Ever since, the Mouse Guard has defended the paces and prosperity of its kingdom. For generations, this league of scouts, weather-watchers, trailblazers, and protectors has passed won its knowledge and skills. To ask other readers questions about Mouse Guard, please sign up. My girlfriend picked this up for my son, who has recently turned 7. He's a big reader, and he loves comics. Though he hasn't been tested, is probably reading years ahead of whatever the standard metric is. Unfortunately, Sarah made one of the classic mistakes here, and judged a book by its cover. In fact, she made the mistake twice. 1. She assumed that because it was a comic, it was probably for kids. 2. She assumed that a book with animal characters is for kids. This is a mistake that someone who h My girlfriend picked this up for my son, who has recently turned 7. This is a mistake that someone who has better comic literacy never would have made. If for not other reason than because they'd read Maus at some point in their lives. But that doesn't mean it isn't a good book. It is. The art is great, and the comic paneling is excellent in a way that I couldn't have understood 5 years ago, before I'd read several thousand comics. So while it didn't strike home with my boy. It struck home with me. The story is strong, and the storytelling and art are truly beyond the pale. So... yeah. I wouldn't recommend it for kids under 10 or so. But if you're older than that it's well-worth your time. Looking at lavishly drawn and colored mice with swords was pleasant enough for a few pages, but I am afraid it only does so much for me. The high fantasy world of Mouse Guard feels underdeveloped and surprisingly generic underneath its furry surface - I got the impression that David Petersen was so keen on seeing his mice in action that he neglected the basics of fantasy storytelling, namely world building and character development. Gorgeous book. The story owes a huge debt to Redwall, but the artwork is the real reason to read this book (and slowly). One review called the illustrations "sumptuous," and I can't beat that word. The colors are lush and glowing, and pattern & texture are used to great effect to show depth and distance. I noticed that David Petersen earned his BFA in printmaking, which would explain the care taken in composing each panel. Even though these aren't prints, I can imagine that when you get in t Gorgeous book. The story owes a huge debt to Redwall, but the artwork is the real reason to read this book (and slowly). One review called the illustrations "sumptuous," and I can't beat that word. The colors are lush and glowing, and pattern & texture are used to great effect to show depth and distance. I noticed that David Petersen earned his BFA in printmaking, which would explain the care taken in composing each panel. Even though these aren't prints, I can imagine that when you get in the habit of thinking in reverse images, it strengthens your compositions. Also, his line work reminded me of Barry Moser's prints. The Mouse Guard exists to provide safe journey and protection from one hidden mouse village to another. To a mouse, the entire world is full of predators. Just imagine how huge and terrifying it would be to battle a group of crabs...or a snake! (Some blood and violence...these are warrior mice.) The ancient and powerful weapon, the Black Axe, has fallen into the wrong hands. Will one of the Mouse Guard's own soon betray the Guard? A book about warrior mice comes off as the sort of comedy comic I'd pick up in the 90's, flip through, and put back dismissively. There's been a certain disdain for talking animal comics among serious comic writers for about as long as the comic industry has existed in America. What sets Mouse Guard apart is that the creatures don't seem all that anthropomorphized. The author basically took a step back and observed that life for a mouse civilization would be much scarier and more difficult than a A book about warrior mice comes off as the sort of comedy comic I'd pick up in the 90's, flip through, and put back dismissively. There's been a certain disdain for talking animal comics among serious comic writers for about as long as the comic industry has existed in America. What sets Mouse Guard apart is that the creatures don't seem all that anthropomorphized. The author basically took a step back and observed that life for a mouse civilization would be much scarier and more difficult than an human society. The Mouse Guard are the most skilled and valorous members of mice society, who ensure that travel and trade is kept safe from city to city. How perilous their work is comes of in the sheer number of predators who attempt to make easy snacks out of them. I don't think a crab has ever been as menacing as the ones featured in this story. A character is nearly killed after successfully killing a snake from inside its mouth, and the menace of weasels, wolves, and owls are regularly mentioned. The overall atmosphere constantly reminds you that being a mouse is hard, brutal, and short. The only real issue I had is the length. I guess I expected more story from a graphic novel, and there are entire pages, sometimes a series of pages that do nothing more than show off style and artistry. As a result I felt like I was getting a small glimpse into what should have been a major conflict in their little, mousy world. Vrlo lepa fantazijska prica o misevima koje se bore da prezive izadaju iz sopstvenih redova. Certezi su vrlo lepi, sa puno boja i detalja koje od svake strane prave malo umetnicko delo. Sama prica je ffino napisana i lako se prati ali pati od jednostavne forme i predvidivih dogadjaja. Likovi (misevi :) ) su fino opisani mada ne saznamo puno o njima. U svakom slucaju ako vam se cita lem strip sa zivuljkama u glavnoj ulozi samo navalite. We mice have little chance in this world, considering all the critters that eats us. And so, the Mouse Guard was formed to keep the borders safe and protect against all evil and harm that may threaten their territories. They slay serpents and giant crabs, (oddly enough, owls, hawks, and even cats don't seem to be a problem), but their biggest threat comes from other mice. When a grain merchant is found dead, the guard discovers he was carrying a map of their city, and the race is on to find out to We mice have little chance in this world, considering all the critters that eats us. When a grain merchant is found dead, the guard discovers he was carrying a map of their city, and the race is on to find out to whom the traitor planned to deliver this secret. Very cute and ferocious mice! I love that there is an entire "mouse world", complete with fortified cities where each mouse has their place in the world. The drawings were excellent, especially the full-page drawings featuring natural mice foes (snake, crab, owl). And the added maps, guides, and gallery at the back of the book were fun to look through. Sincerity and simplicity are endangered concepts in much of today's fantasy offerings -- be they books, movies or games -- but "Mouse Guard" recalls the fare of my youth, like "Watership Down" and "The Secret of NIMH," where even the most unassuming creatures face epic trials of life and death and morality. Think of it as a "Lord of the Rings" for mice, but instead of battling balrogs, these warrior mice struggle against snakes and crabs, and instead of Sauron and his minions, they combat treache Sincerity and simplicity are endangered concepts in much of today's fantasy offerings -- be they books, movies or games -- but "Mouse Guard" recalls the fare of my youth, like "Watership Down" and "The Secret of NIMH," where even the most unassuming creatures face epic trials of life and death and morality. Think of it as a "Lord of the Rings" for mice, but instead of battling balrogs, these warrior mice struggle against snakes and crabs, and instead of Sauron and his minions, they combat treachery from within their fragile community. "Mouse Guard" draws its magic from a rich lore lovingly construction by author and illustrator David Petersen. The sumptuous artwork glows with a warm color palette, as if the illustrations would drip from the pages, and the contrast of shadow and light make the images jump from the page. The main protagonists -- the mice who safeguard the villages within the border -- aren't rendered cutesy or cartoony. Who would have thought so much expression could be portrayed with beady, little eyes and nearly featureless, fur-covered faces? Yet Petersen succeeds in conveying emotion. 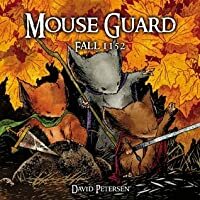 David Petersen's Mouseguard is a so-far-incredible series that pits medieval mice against both their common predators (snakes, owls, weasels, etc.) and their own kind. As the series is yet to be completed, it's hard to judge how well the series-as-whole will hold up—but if Petersen continues to show the kind of storytelling attention and illustrator's care that we see in the first two volumes, the final result will be worthwhile indeed. 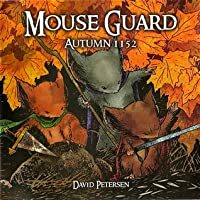 With Fall 1152, Petersen introduces a world within (presumab David Petersen's Mouseguard is a so-far-incredible series that pits medieval mice against both their common predators (snakes, owls, weasels, etc.) and their own kind. As the series is yet to be completed, it's hard to judge how well the series-as-whole will hold up—but if Petersen continues to show the kind of storytelling attention and illustrator's care that we see in the first two volumes, the final result will be worthwhile indeed. 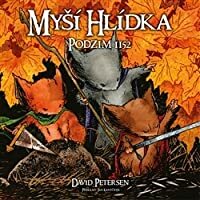 With Fall 1152, Petersen introduces a world within (presumably) our world and goes beyond the realistic animal-fantasy honed in Richard Adams' Watership Down . Instead, this is a world in which mice have fostered a civilization, have made strides in both industry and academia. These mice boast metallurgy, pharmacy, architecture, libraries, cartography, and that hallmark of all the greatest civilizations, intrigue. There are castles and dungeons and cities hidden within trees. Wars and rumours of wars. 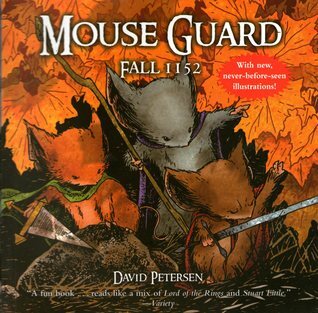 Petersen spends much of the first volume introducing us to both his world and his characters (primarily, a trio of mice warriors, members of the vaunted mouseguard, whose purpose is to protect the commoner keeping the roads safe and keep peace between the very different (and fairly isolated) towns. Because so much of the volume is taken up with story-setting and world-building, it takes a little while for the main story to really get rolling. Once it does, however, Petersen's attention to his characters and their motivations and abilities is pushed even farther to the fore. I tried to like this. I really did. My buddy told me it was great. I opened the book and right away liked the art. I told myself, hey, it's Mice. This could be good...IT COULD BE....but sadly it was not. The idea behind this is the mouse guard send out three warriors to find out what happened to a missing mouse. Death occurs and the big fallout happens where we have to find out why we have traitors in our midst! Then a side story of someone else meeting a old guy because...oh man I dunno. What I I tried to like this. I really did. My buddy told me it was great. I opened the book and right away liked the art. I told myself, hey, it's Mice. This could be good...IT COULD BE....but sadly it was not. The idea behind this is the mouse guard send out three warriors to find out what happened to a missing mouse. Death occurs and the big fallout happens where we have to find out why we have traitors in our midst! Then a side story of someone else meeting a old guy because...oh man I dunno. What I liked: The art. It's really cool and kind of messy, but it works well. I also thought one of the mouse guards was kind of cool, like a badass, who doesn't listen. What I didn't like: No character besides the one stuck out. The fights were hard to follow at times. The dialog was stiff and boring. I didn't care about the world building mostly because I didn't care about the mice. The cuteness of the mice is in stark contrast to the seriousness of the comic. The setting is harsh, survival is difficult for mice, given the many predators they face. The Mouse Guard are sworn to protect their brethren, but there is a secret party who believes that the Guard must be replaced as it's not effective any more. The Mouse Guard will be threatened in their own home by an unexpected and well-organized foe and will need to band together to face him. Lieam, Kenzie, Saxon, all of the Mous The cuteness of the mice is in stark contrast to the seriousness of the comic. The setting is harsh, survival is difficult for mice, given the many predators they face. 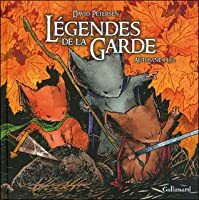 The Mouse Guard are sworn to protect their brethren, but there is a secret party who believes that the Guard must be replaced as it's not effective any more. The Mouse Guard will be threatened in their own home by an unexpected and well-organized foe and will need to band together to face him. Lieam, Kenzie, Saxon, all of the Mouse Guard, while searching for a missing merchant, discover that he had a map of Lockhaven, the home of the Mouse Guard, upon him. He was likely intending to sell it, but was eaten by a snake on the way to his buyer. The three now investigate Barkstone to find who was involved in the traitorous exchange, but they can't yet reveal their findings even to other Mouse Guards. (view spoiler)[Lieam infiltrates a group called the Axe and is later captured, but not before finding that the Axe army is marching on Lockhaven. Kenzie and Saxon are also captured, then freed by an old Mouse Guard champion named Celanawe, the Black Axe, who joins them. Gwendolyn sends word to Sadie about Conrad, a missing Mouse Guard stationed in Calogero. Conrad witnessed when the merchant received the map of Lockhaven from a mysterious mouse. Sadie barely gets away from a group of crabs that attack Calogero. Conrad falls while allowing her to escape. She makes her way to Lockhaven and warns Rand, the Mouse Guard defense expert, to lock down the city. The Axe must now assault Lockhaven directly. Recommends it for: People who like stories with mice in them. I don't like anthropomorphic stories. The Secret of NIMH never did it for me. I never finished Watership Down. Animal Farm was way too clever and even its political similies were lost on me when I was 15. I have seen and heard and spoken with Brian Jaques, but I haven't cracked the cover of Redwall yet. Lieam, Saxon, and Kenzie are the primary characters of Mouse Guard and they are, yes, mice. So are Gwendolyn and Sadie and Conrad. Ditto Celanawe. Mice. I hate stories with mice in them. But not th I don't like anthropomorphic stories. The Secret of NIMH never did it for me. I never finished Watership Down. Animal Farm was way too clever and even its political similies were lost on me when I was 15. I have seen and heard and spoken with Brian Jaques, but I haven't cracked the cover of Redwall yet. But not this one. Mouse Guard is both gripping and visually gorgeous. I love good line and David Peterson knows how to throw lines together. His coloration captures fall perfectly with its browns, oranges, reds. Mouse Guard is a beautiful book. Příjemná jednohubka zaměřená spíše na mladší publikum. Je to takový mezistupeň mezi leporelem pro nejmenší a klasickým komiksem. Exceluje to především po výtvarné stránce. Ovšem s příběhem je to horší. Mnohem horší; žádný totiž nad výchozí rámec "myší ochránci slabých na cestách" není. Not anything new but was a nice mouse adventure and I absolutely adored the art. I've thought Mouse Guard is suppose to be about kickass mice; I can't help but think how cute they are when fighting snakes and stuff. Also Saxon is the best!!!! Un inicio prometedor, veremos que tal los siguientes de la saga. Petersen is for sure a talented graphic artist. I enjoyed looking at this even though the story (aside from the substitution of mice for humans) is pretty generic. One of the greatest achievements in comic art of the last 10 years. A tale that works on so many levels it is the true All ages comic. Young and old will get something out of it. It's the cavalier worlds of derring-do, Robin Hood and the like transferred, and reduced to the world of mice. The surface of cute anthropomorphism it has underneath it a stunning mix of intrigue and adventure. The art is wonderfully rendering with care and attention to detail instantly recalling all the best art you saw i One of the greatest achievements in comic art of the last 10 years. The surface of cute anthropomorphism it has underneath it a stunning mix of intrigue and adventure. The art is wonderfully rendering with care and attention to detail instantly recalling all the best art you saw in books as a child. You can't help but root for the mice heroes, armed with sewing needles and fishing hooks.It's doubtful this story would have worked with any other type of animal. Its rare that a book you could happily leave with your kids can also work as a thrilling page turner for adults. This was the biggest out-of-nowhere indie hit of the comic book world last year. With comparisons to "Bone" and "The Secret of NIMH," I knew it would never live up to the hype. But I enjoyed it nevertheless. The art was terrific, the world felt authentic, and the characters were instantly likable. I just think the story he was trying to tell was a little more epic than he gave himself room for. A lot of important stuff got skipped in "meanwhile..." chapter breaks and I wanted more development of This was the biggest out-of-nowhere indie hit of the comic book world last year. With comparisons to "Bone" and "The Secret of NIMH," I knew it would never live up to the hype. But I enjoyed it nevertheless. The art was terrific, the world felt authentic, and the characters were instantly likable. I just think the story he was trying to tell was a little more epic than he gave himself room for. A lot of important stuff got skipped in "meanwhile..." chapter breaks and I wanted more development of the main characters and room for the action to breathe. Wow. This was intense and captivating with elements of fantasy that feels like historical fiction (think A Song of Ice and Fire but with mice and way more child-friendly) meets Watership Down and or The Rats of NIMH. Loved the art, especially the mice illustrations. The snake scenes were a little too intense for my ophidiophobia. While I think a book like this has a lot of wide age-range appeal and appropriateness (and, personally, would put it in the hands of grades 4-6 kids who are doing repor Wow. This was intense and captivating with elements of fantasy that feels like historical fiction (think A Song of Ice and Fire but with mice and way more child-friendly) meets Watership Down and or The Rats of NIMH. Loved the art, especially the mice illustrations. The snake scenes were a little too intense for my ophidiophobia. My 11 year old nephew, Jonah, is a fan of comics, so I've been reading several middle grade ones to sample what might interest him. Reading this graphic novel just made me happy. It is the story of mice and mousey things. There is intrigue, and murder, and betrayal, though the plot is a little weak. Think of this as a much watered down Game of Thrones for mice. The art though is sumptuous, and is really the main attraction here. My nephew started reading this one, and is liking it so far. Komiksová fantasy, kde myši mají pré. Nebo aspoň aspirují na nejvíc badass zvířecí druh, který si to hodlá rozdávat s hady či kraby a nebojí se při těchto epických bitvách umírat. Luxusní počin. Note: There are more than one David Petersen on GR's database. For catch-all profile, see here (dissambiguated via 7 spaces). David Petersen was born in 1977. His artistic career soon followed. A steady diet of cartoons, comics, and tree climbing fed his imagination and is what still inspires his work today. David won the 2007 Russ Manning Award for Most Promising Newcomer. In 2008, David won the E Note: There are more than one David Petersen on GR's database. For catch-all profile, see here (dissambiguated via 7 spaces).